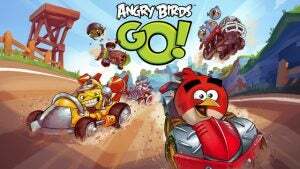 Angry Birds Go is the latest addition to the Angry Birds franchise and comes in the form of a Mario Kart-like racing game. This 3D adventure is a downhill, soapbox cart racer where you can play as all the characters from the Angry Birds series. It’s a rather brave move away from the 2D physics-based point and aim Angry Birds we’re all used to, but one that is still very appealing to gamers of all age groups. games, and are constantly being updated, even several years later. From the outset, it’s clear that Angry Birds Go is easy to play and fairly addictive, especially for short bursts of time. The familiar, colourful characters are all there and each has their own unique power-ups to use against the opposition. The controls are very straight-forward. You can either steer using tilt controls or on-screen buttons, and there’s no acceleration or braking to worry about as it’s a downhill racer and gravity does it all for you. You start off with one character, the Red bird, and one car. You can unlock new characters by completing races similar to boss battles, although you will have to complete each of the character races three times to get said character. The physics are great, with cars noticeably getting better the more in-game coins you spend on upgrades and there are plenty of power-ups to mess around with as you get further into the game. Surprisingly there’s a great variety to the races available as well. In one race type you’ll have to avoid obstacles to finish a race before a timed-bomb goes off, in another you have to splat through as much fruit as you can before crossing the finish line. Of course, there are classic versus races as well. In order to progress successfully through the various levels, you’ll need to work out which cars and characters are the most appropriate. This requires a fair amount of grafting on your part as you’ll have to earn coins to purchase upgrades. As part of the freemium model, beyond the first three car options you have to purchase cars using real-world currency. You might be able to complete the game using fully-upgraded stock vehicles, but we sincerely doubt it and Rovio is charging a premium for the other vehicles. At the time of writing, there’s a sale on one of the mid-range cars, but it’s still priced at £6.99. There’s a slightly better than stock option for £1.99, but for the best soapbox carts you should be prepared to pay a whopping £34.99. What we thought was a bit crafty of Rovio is that none of the car prices beyond the three starter options are actually listed in the app itself. You have to tap through to the iTunes purchase screen to be presented with the staggering figures, something that seems a little devious, especially for a franchise so popular with children. If you’re in the market for additional vehicles, but don’t want to get their via in-app purchase, there are physical Hasbro Telepods cars and characters that can be scanned directly into the game. This is a fantastic expansion for children, but frustrating for adults looking for a game as a quick time-filler. You can avoid spending money in Angry Birds Go though, if you’re prepared to put in the hard graft. Rovio has limited long sessions in Angry Birds Go by introducing an energy system that means each character can only compete in five races before needing a rest to recharge, something that definitely wasn’t present in any other Angry Birds game. Each character takes at least 10 minutes to recharge and as you gain more characters this becomes less of an issues. However, the limitations of the energy system does mean the initial slog to get more than two characters can become a little laborious. The whole free-to-play system may evolve over time, as it has in other freemium titles, but so far we haven’t experienced a payment wall that would otherwise make us stop playing. It really can’t compare to the unobtrusive free-to-play model of Plants vs Zombies 2: It’s About Time, though. One of the more disappointing elements of Angry Birds Go is the 3D graphics. This is Rovio’s first foray into 3D and it really shows. The 3D sections are far from crisp and are especially shown up when they are side by side with cartoon 2D menus. You’ll probably forget about this once you get going, but it’s disappointing if you’ve got one of the latest phones or tablets — it just won’t show off what they’re capable of in the slightest. Despite Angry Birds Go being slightly spoiled by its freemium model, it’s still thoroughly enjoyable and worth a download for those loyal to the series. It’ll be interesting to see how the game develops as Rovio adds new features as well, but anyone who has grown bored of the series won’t flock back for this. The post Angry Birds Go appeared first on Trusted Reviews.